I am always willing to drop everything to read a Susan May Warren novel. Or a Susan May Warren novella, in this case. At least if it is one that takes place in Deep Haven. This story is part of the Christiansen family series (I'll be reviewing the newest novel in that series on Saturday) which involves the Christiansen siblings. The novella, however, is about Mom and Dad. The second novel, It Had to Be You, had a bonus at the end. A few chapters about how John and Ingrid got together back in the 70s. 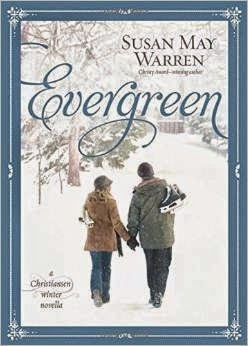 Evergreen takes their story back to the present. Taking place after the third novel (the one I'm reviewing on Saturday), John and Ingrid are empty nesters having some issues with adjusting to life after the kids have grown up and left. Throw in some complications with a surprise trip to Europe, a commitment to heading up the Living Nativity performance, and taking on the temporary care of a sixteen-year-old nephew, and it gets messier and messier. Can they learn to communicate again? This was a quick read, and I certainly enjoyed it. Warren writes Minnesota so well, and I'm always homesick after reading her tales. I'm glad to learn a little more about "Mom and Dad" in this Christiansen saga. It was also really nice to see a few characters from other Deep Haven novels popping into this one. It is nice to get a glimpse of their lives again.